For many Americans, it’s not uncommon to see another new mega-shopping center or residential subdivision being built somewhere nearby. With new houses and businesses springing-up all the time in urban and suburban America, should we view this as progress, or are we approaching the point where we are starting to run out of space? If you’ve every wondered if we’re running out of elbow room, here’s an interesting thought experiment. 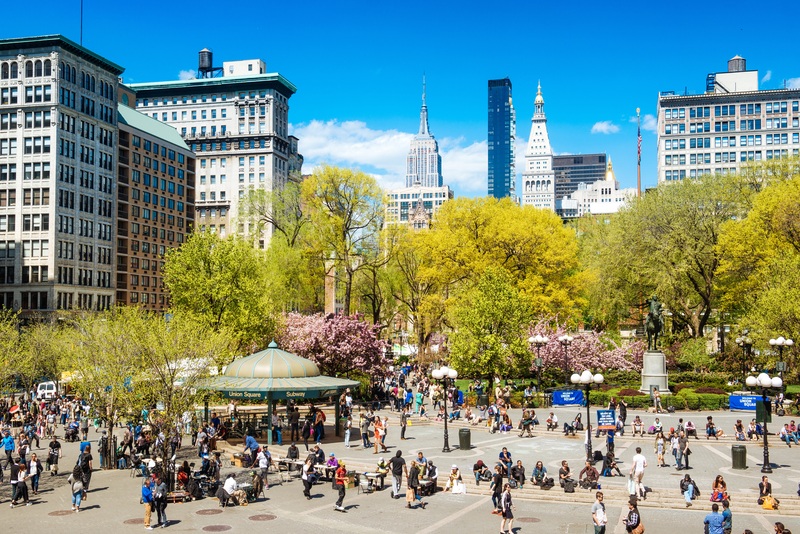 New York City, which is far and away the most populous city in the U.S., was home to an estimated 8.5 million people in 2016. More people live in this one city than in the entire states of Idaho, Montana, North Dakota, South Dakota, Wyoming, New Mexico, Vermont, and the District of Columbia combined. New York City consists of five boroughs spanning five counties, the most densely populated of which is New York County. This county, which consists principally of the island of Manhattan, is far and away the most densely populated county in the U.S., housing 72,000 people per square mile. [1-2] At that population density, the entire population of the United States, Puerto Rico, and other U.S. territories could reside in the tiny State of Connecticut. 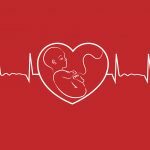 According to the U.S. Census Bureau, the population of New York County in 2016 was 1,643,734. But of course, that’s just the number of people who live in the county. The number of people who commute into Manhattan every day increases the actual population of the island by several millions more. The New York State Government estimates that the population of New York County swells to about 3.9 million people on an average business day. The second most densely populated county in the U.S., Kings County (better known as Brooklyn), lies just across the East River from Manhattan. At 37,000 people per square mile, Brooklyn has slightly less than half the population density of Manhattan. 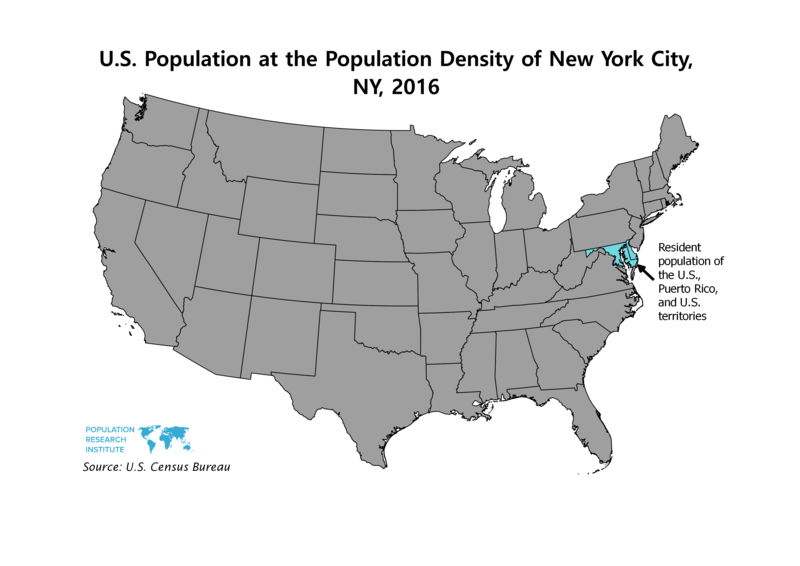 [1-2] The top four most densely populated counties in America are all in New York City. The most densely populated county in the U.S. outside of New York City is San Francisco County, which has only a quarter of the population density of New York County. But perhaps New York City life is not quite your cup of tea (personally, I quite enjoy it myself). 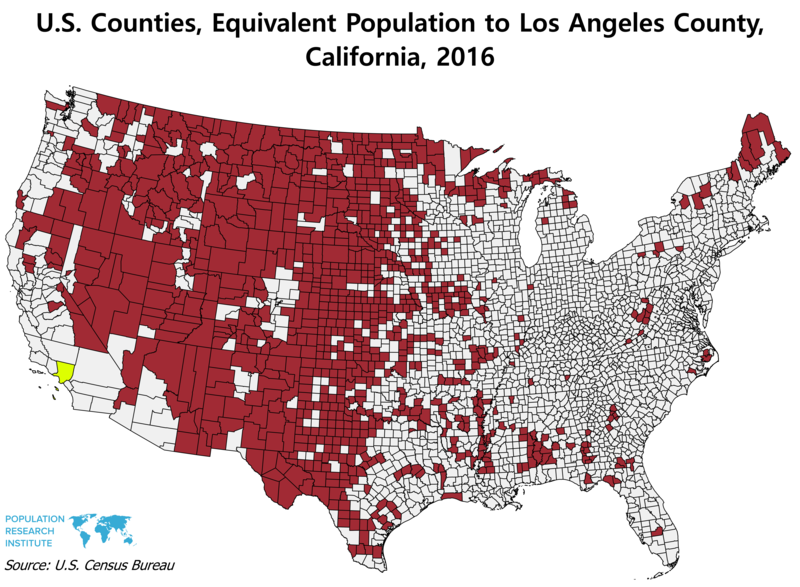 Let’s continue our thought experiment, and see how the U.S. population could hypothetically be distributed if it were at, say, the density of Los Angeles County, California. While Los Angeles County encompasses the second most populous city in the country and a number of its neighboring cities, it also includes expansive uninhabited areas including vast stretches of the Angeles and Los Padres national forests and the Santa Monica Mountains. Overall, the population density of Los Angeles County is about 11 times less dense than New York City and ranks 49th overall among U.S. counties nationwide. Over 10.1 million people call Los Angeles County home. But if you know Los Angeles County, or are familiar with any of the counties listed above, you also know that life at this population density is quite comfortable, with plenty of parks, open spaces, and many acre sized residential properties. Yet from sea to shining sea, there is even more space still. The map below gives an example of just how much. If we rank all U.S. counties by population density and taking the least populated counties in the contiguous U.S., this is what we find. The resident population of the counties in red equals the resident population of Los Angeles County (shown in yellow) in 2016. The total land area of these counties is 363 times the land area of Los Angeles County. If we include Alaska, the total land area of U.S. counties that equal the population of Los Angeles County is almost five hundred times times the area of the county. 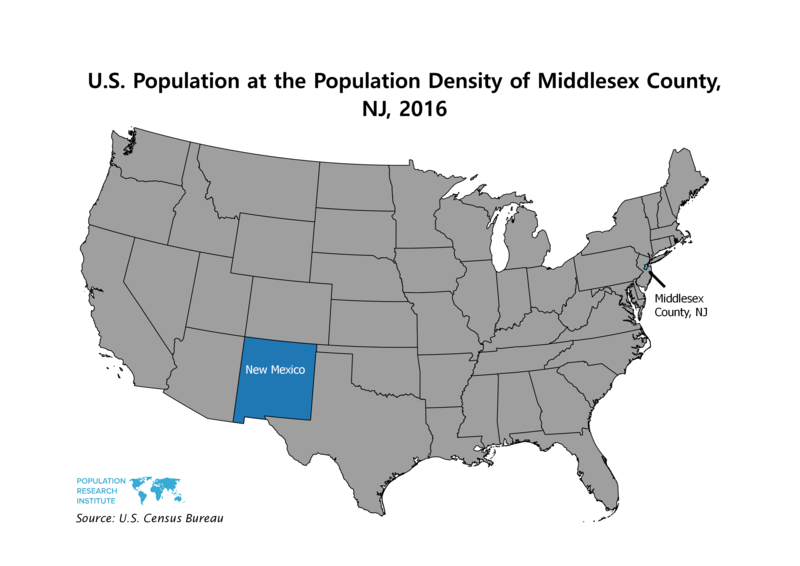 Finally, at the same population density of Middlesex County, NJ, which is only a little more densely populated than Los Angeles County, the entire U.S. population could fit inside the state of New Mexico. Does this mean that the entire population of the United States could actually fit into an area the size of New Mexico at this population density? Probably not. 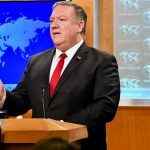 We would still need to figure in access to adequate water resources and would need much more land area to account for agricultural purposes, public services, transportation, military, Native American lands, and, of course, sustainability and conservation. Nevertheless, the point of our thought experiment is this: If America has enough elbow room to fit our entire population comfortably into an area the size of New Mexico, we probably have enough room for the other things as well. And I’m pretty sure we’re not going to be running out of room any time soon. U.S. Census Bureau, Population Division. Annual estimates of the resident population: April 1, 2010 to July 1, 2016. PEPANNRES. 2016 Population Estimates. Counties. U.S. Census Bureau, Census 2010. Land area in square miles 2010 (LND110210D). U.S. Census Bureau, unpublished data from the MAF/TIGER database. France Diplomatie. Présentation de Monaco [Internet]. Available at http://www.diplomatie.gouv.fr/fr/dossiers-pays/monaco/presentation-de-monaco/. United Nations Department of Economic and Social Affairs, Population Division. World Population Prospects: The 2015 Revision; 2015. One thought on Is America Running Out of Elbow Room? I once listened to a population analysis who figured out that the entire US population could fit into the State of Texas with ample room to move around freely! This was a year, or so, ago! Ha….